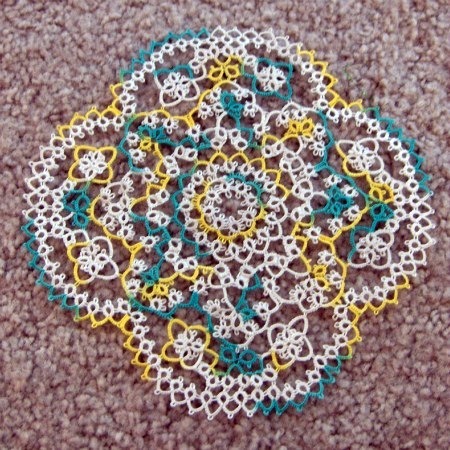 This old doily has waited patiently for me to finish it for oh, five or six years. 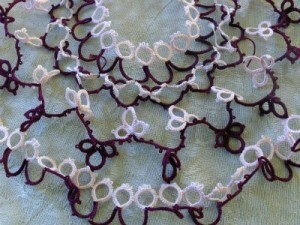 It has been so long now that I don’t even remember when I finished the tatting. All there is left to do is sew in a few ends and block it, and with one thing and another I haven’t gotten around to doing it. Until now. 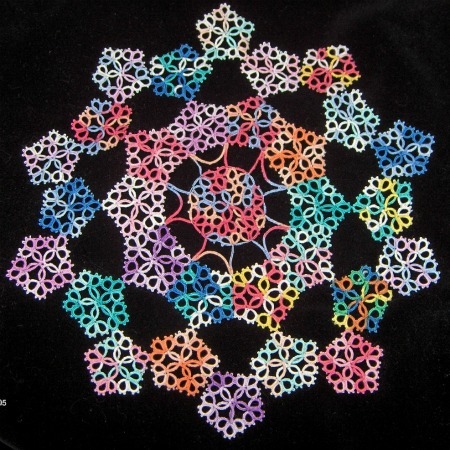 This special doily will be featured in my next Absolute Beginner tatting lesson, on blocking your project. I’m now glad that I didn’t finish it yet, because it is the perfect demo: wrinkly and large and circular, so I can demo how to block a large piece. Well, at least one way of blocking it. I can’t exactly undo and redo it five different ways once it is blocked. 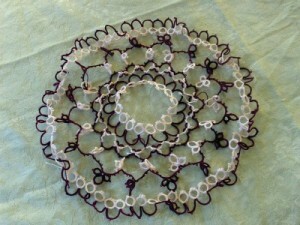 Though I do have two other doilies sitting in a drawer, they both have other problems and aren’t ready for blocking. So, over the next week or two I will hide the ends, pin it like a mad woman, break out the starch and take pictures all along the way. What is your favorite method of stiffening? I usually use spray starch, but sometimes watered down Elmer’s glue. Do you prefer starch, glue, sugar, something else? personally i prefer glue. glue watered down a bit. and applied with a paintbrush. Karen, I’ve used that for quilting but haven’t tried it on tatting yet. I’ll have to try it on a smaller piece. Thanks for the tip! Don’t use sugar! We were given a lovely doily that was blocked with sugar. Withing a couple of years it got really moldy. That is a sad fate for a beautiful doily.